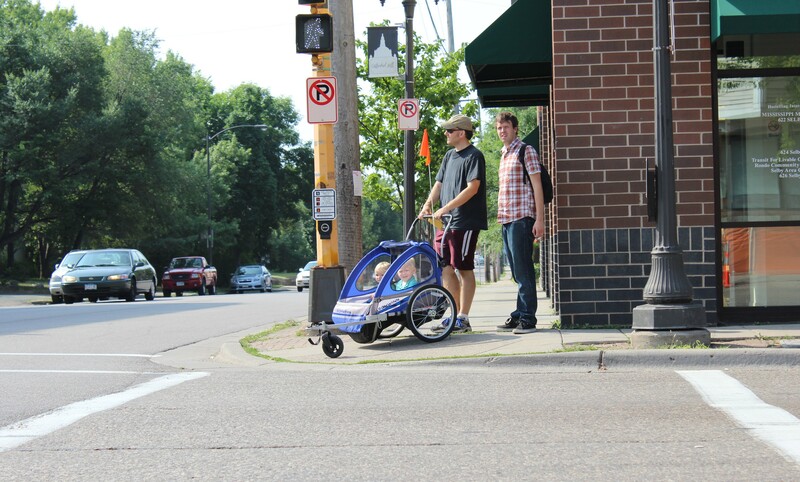 Work on bike and pedestrian counting by University of Minnesota researchers and MnDOT has been highlighted as part of the FHWA’s Livable Communities Case Study Series. The case study features the Minnesota Bicycle and Pedestrian Counting Initiative, led by the U of M’s Greg Lindsey and MnDOT’s Lisa Austin and Jasna Hadzic. Under the initiative, the team has developed general guidance and consistent methods for counting bikes and pedestrians. Team members have also worked with other state and local agencies to implement counting strategies across Minnesota. The case study showcases the initiative as an example of how agencies can leverage partnerships to implement a successful counting program for nonmotorized traffic. These traffic counts can help agencies identify safety concerns, understand and communicate benefits of active transportation, prioritize investments, and analyze trends. According to the FHWA, the results can help inform decisions that make biking and walking viable transportation options in livable communities. Read the case study on the FHWA Livability website. The conference sponsors invite individuals, communities and partnerships to share stories of how they are building better places to bike through planning, policies, infrastructure, events and strategic funding. For more details or to submit a presentation idea, visit https://survey.vovici.com/se.ashx?s=56206EE369B6F330. Last year, 41 people were killed while walking or biking on Minnesota roads and nearly 1,700 were injured. We asked Barnes to highlight her favorite bike and pedestrian safety countermeasures used in Minnesota. An unusually effective new pedestrian warning device, called the Rectangular Rapid Flashing Beacon, has become quite popular. Studies have shown that the number of motorists stopping for pedestrians increases from 18 to 81 percent with the RRFB. Another plus: the device doesn’t appear to lose its effectiveness over time. After two years, compliance has been shown to still be more than 80 percent. It’s not uncommon for a motorist to stop for someone in a crosswalk, only for the vehicle following them to not see the pedestrian and veer around, driving through the crosswalk. But an advanced stop line, placed 20 to 50 feet prior to a crosswalk, is effective at making both vehicles stop and see the person in the crosswalk. “They are a really good option at an unsignalized, mid-block crossing,” said Barnes, although the stop line may not be a good option for a two-way stop. 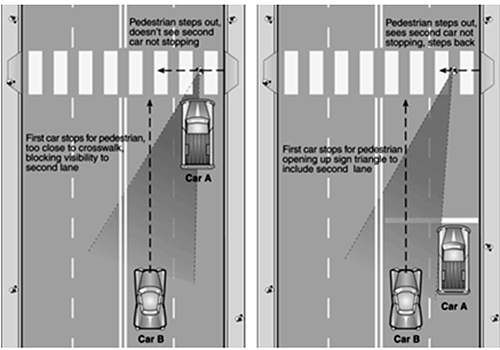 Advanced stop lines have been shown to reduce pedestrian-vehicle conflict up to 90 percent; however, stop lines shouldn’t be placed too far in advance of the crossing, because motorists might then ignore them. An innovative treatment called the Leading Protected Interval minimizes conflict by allowing pedestrians to enter a signalized intersection before vehicles do. The walk signal begins three to seven seconds before the parallel street turns green by extending the time all lights are red. A right turn on red can be prohibited with this device; however, even without the prohibition, the Leading Protected Interval has been shown to reduce crashes by 5 percent. 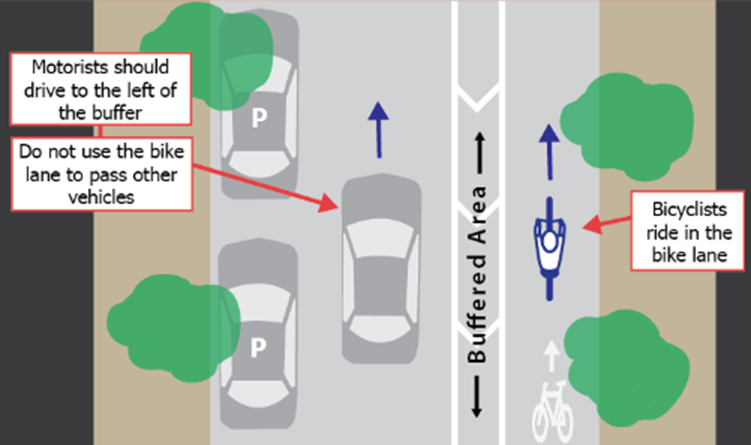 Bike lanes buffered from traffic with some sort of physical barrier, even parked cars, will reduce all types of crashes. They also increase comfort levels for cyclists, helping keep bikes off the sidewalk. Protected bike lanes, also called cycle tracks, also have a traffic-calming effect. In New York City, the cycle track reduced all types of crashes an average of 40 percent and up to 80 percent on some roads. For those reasons, two-way cycle tracks work best on one-way streets, she said. 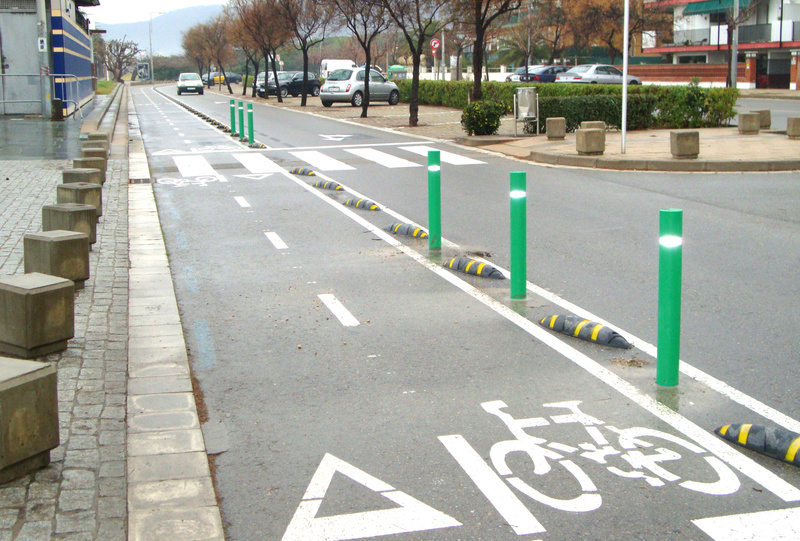 Flexible bollards create temporary curb lines that encourage vehicles to slow down. They can be installed easily and inexpensively. Flexible bollards bend up to 90 degrees when struck by an errant vehicle. They do not physically stop a car, but encourage vehicles to stay within their lane. Although they can create additional maintenance, they are a good interim solution at locations that need an immediate fix, but have no funding to do so.